Seven Kentucky fans who harassed and threatened referee John Higgins after the team’s Elite Eight loss have been identified by law enforcement, according to the Associated Press. The investigation was done by officials in Nebraska, where Higgins lives and manages a roofing company. A state prosecutor said yesterday that the identifying information would be released to proper authorities in the fans’ own jurisdictions, as well as the FBI’s Omaha field office. Local charges will not be filed. 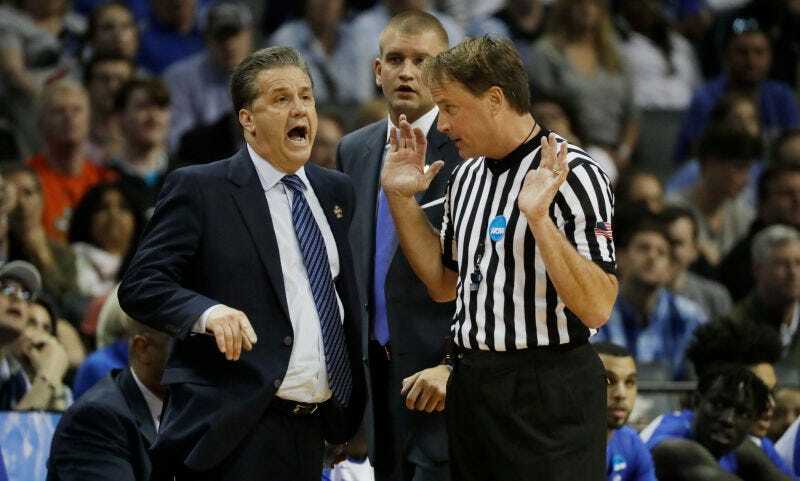 Coach John Calipari criticized the officiating in Kentucky’s loss to eventual champion North Carolina in his postgame press conference, and Higgins soon was flooded with harassing emails and thousands of phone calls that included death threats for him and his family. Fans also inundated his roofing business with negative reviews until he was forced to take down its Facebook page. The Nebraska prosecutor told the AP that the threats had come from fans in several different states. He also noted that law enforcement had identified two media outlets which posted and promoted Higgins’s contact information, saying that the Federal Communications Commission had been notified and will look into potential violation of federal regulation.